Rock Island’s location at the junction of two major rivers is enviable. But rivers are a mixed blessing, especially where children are concerned. Playing or swimming in the river currents can be treacherous, as it was for 6-year old Helen Margaret Horst. On the morning of August 24, 1912, no one noticed as she wandered away from her family’s summer cottage on Vandruff’s Island on the Rock River. At the river’s edge she launched a small boat and stepped in, but the unsteady craft tipped her into the river where her short life ended. Although the Horst family had seven other children, they never forgot little Helen. 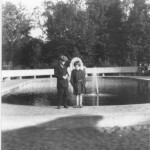 In 1921, the now prosperous parents announced that they would build a wading pool in Longview Park. No longer would children have to play in potentially dangerous rivers. 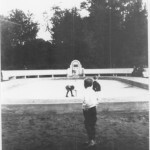 The pool opened in the summer of 1921 and was formally dedicated “to the children of Rock Island” on October 1, 1921, although the dressing rooms were not completed until 1922. 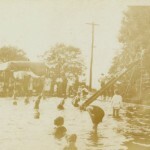 The Helen Horst Memorial Wading Pool is shown on today’s postcard from the Special Collections at the Augustana College library. Built at the edge of the Longview hill, it afforded a wonderful view of the park and provided a “splendid vision to Iowa” as well. 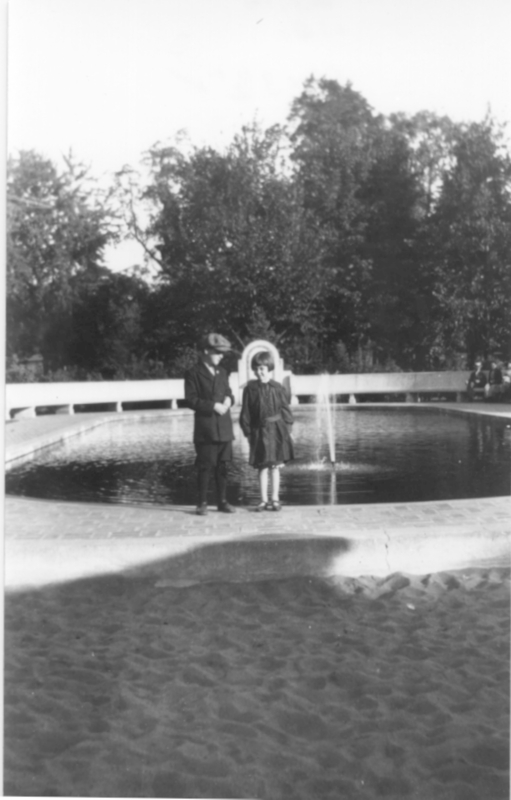 Mr. Horst himself actively supervised the high quality construction of the pool and its surroundings. It was oval, 30 x 80 feet at the waterline, with the main axis extending northwest to southeast. The sides were at ground level with a water depth gradually tapering from 6 inches at the edges to 25 inches at the center. The bottom was a single slab of reinforced concrete varying from 6 to 10 inches thick that was poured on a thick bed of sand. Two fountains in the pool offered both cooling spray and beauty. The 7 foot wide surrounding sidewalk, of mottled “English” brick laid in a basket weave pattern on a bed of sand over 4 inches of concrete, was tilted slightly away from the pool for proper drainage. 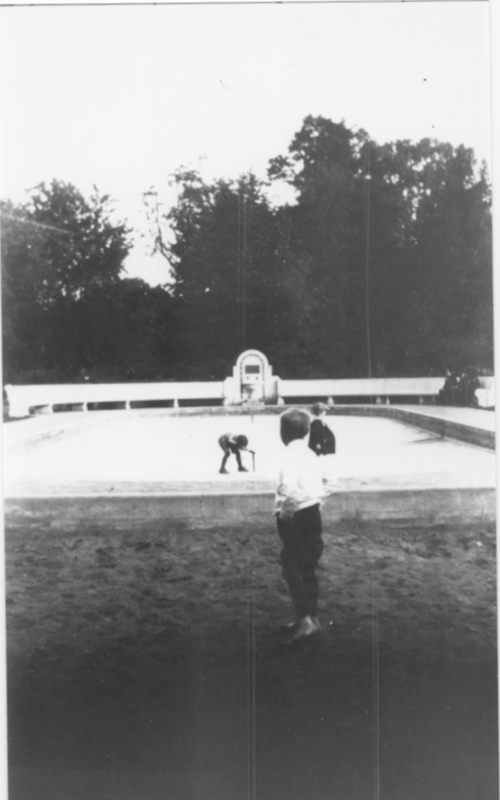 Beyond the northwest end of the pool was a 20 x 30 foot concrete-bottomed sandpit with 18 inches of sand. Edging the sandpit were curved double concrete seats, cast in sections, that faced inward to the pool and outward to the view. These seats were topped by a canvas canopy on steel supports. To the southeast, more curved concrete seats, these without a canopy, faced the pool. In the center of these seats an ornamental two-sided drinking fountain bubbled constantly. Above the fountain was a bronze memorial plaque. The brick dressing room building was to the southeast of the pool. The postcard view is from the northwest end of the pool, looking toward the southeast. The double curved seats, the canopy, the fountain sprays, even the fountain in the distance can be seen. A cut-out close-up of the fountain has been added to the far right of the postcard. The sandpit is not apparent, but would have been just on the far side of the double concrete seats. The Helen Horst Memorial pool closed in the 1940s, when fears of polio swept the nation, and it never reopened. Its site is now a flower garden. But parts of the pool at the crest of Longview are easily recognized. The borders of the wading pool and the sandpit are still there as is the row of double seats, now canopy-less. The drinking fountain is gone and its bronze plaque has been mounted on a new base, right next to the dressing room building, which remains. Even the brick sidewalk is there, mostly covered with asphalt, with a few basket-weave bricks peeping through. 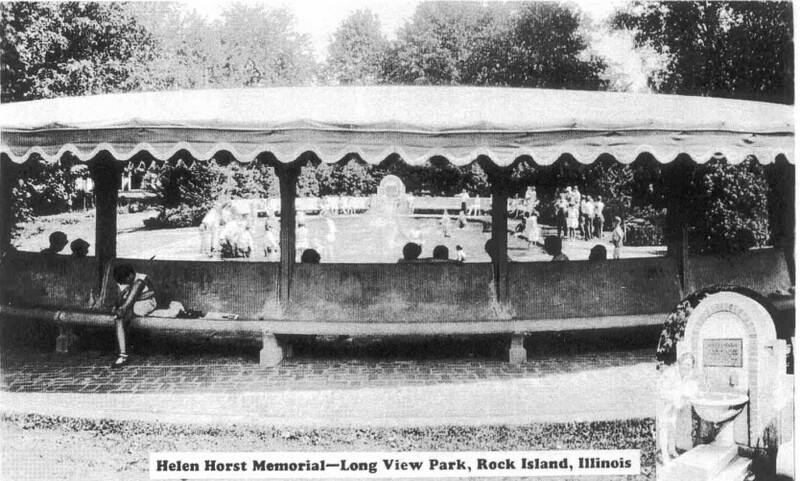 Although Helen’s memorial was built for children, it must have been a delightful place for the entire family. 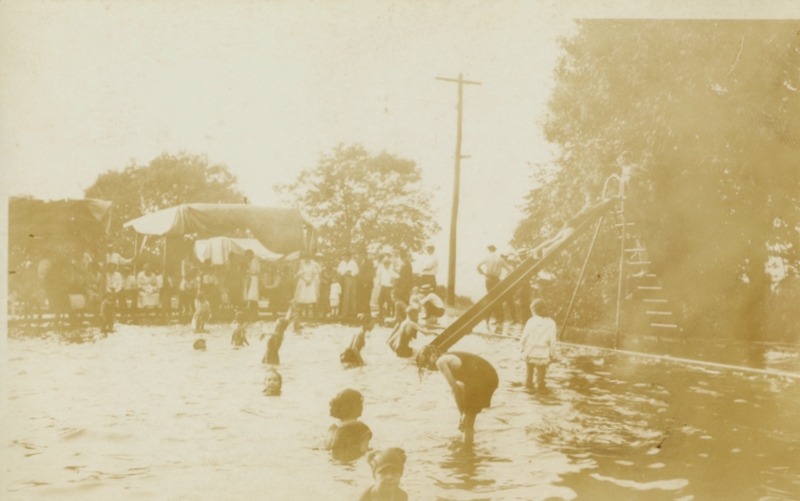 Despite the high-tech swimming facilities now available, such a simple wading pool would be appealing today. This article, by Diane Oestreich, is slightly modified from the original, which appeared in the Rock Island Argus and Moline Dispatch on April 17, 2005. NOTE: The candid shots here are from the Rock Island County Historical Society.